The final major update from Apple today was The Mac Mini. The Mac Mini hasn’t been updated since August 2007. It now features the Nvidea GeForece 9400M integrated graphics and 5 USB 2.0 ports! The new Mac mini is available with a 2.0GHz Intel Core 2 Duo processor with 3MB shared L2 cache, Nvidea GeForece 9400M graphics, five USB 2.0 ports, a FireWire 800 port, a Mini Display port and mini-DVI port for video out, Gigabit Ethernet, AirPort Extreme 802.11n wireless networking, Bluetooth 2.1+EDR, an 8x SuperDrive, and audio in/out ports that support analog, digital and optical signals. The 1GB RAM and 120GB 5400RPM SATA hard drive model is priced at $599, and the 2GB RAM 320GB 5400RPM SATA hard drive model costs $799. A build to order 2.26GHz Intel Core 2 Duo processor is also available. The Mac Mini is now available in the Apple Online Store. 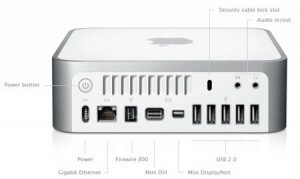 You can read more about the Mac Mini’s features, technical specifications, design, accessories and environmental status report. You can also buy it now from Amazon .